This recipe and photos are from Ourbestbites.com. Bring a large pot of salted water to a boil. While the water is heating, combine olive oil, minced garlic, rosemary, mustard, and some black pepper. Set aside. When the water is boiling, add the potatoes and boil for about 10 minutes or until they are easily pierced with a fork. Drain, return the potatoes to the pan, and then toss with the mustard mixture. Now…this is where the beauty of this recipe comes in. You can either do all of this ahead of time and then refrigerate the potatoes until you’re ready to finish them off or you can do it all at once. Either way, you’re not going to spend more than 30 minutes tops making these beauties and they’re so elegant that you could seriously serve them at the fanciest dinner party. So…if you’re making these right now, preheat your oven to 425 and line a baking sheet with aluminum foil. If you’re saving them (for up to 6 hours), line the baking sheet and spread the potatoes out evenly and then cover them with plastic wrap and refrigerate them until you’re ready to bake them.When you’re ready to bake these guys and the oven is hot, sprinkle with Kosher salt. Bake for 10-15 minutes or until the skins are browning and sizzling. 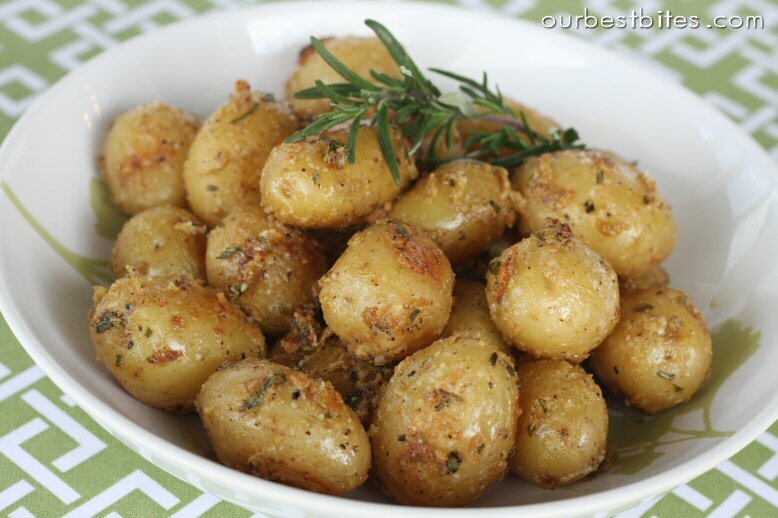 For fancy presentation, place the roasted potatoes on a platter, scrape those delicious bits off the foil, sprinkle them over the potatoes, and then garnish with a few sprigs of rosemary.